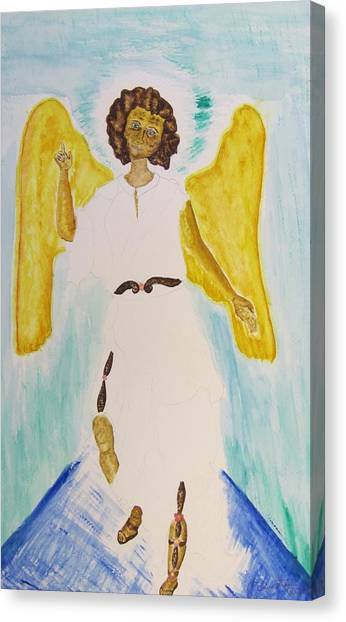 Saint Michael The Archangel Miracle Painting is a painting by Debbie Nester which was uploaded on August 23rd, 2013. The Gold hand which shows in this painting truely is a miracle! I will add the story about what makes this a miracle painting, besides the Gold hand. I thank the person who shared that story. God Bless You! What was intended to be the hand of Saint Michael the Archangel turned out to be a Gold hand being held onto by Saint Michael, within the hand of Saint Michael. Obvious is - that there is someone behind Saint Michael in this Watercolor Painting. That such occurred, an attribute of my Art Work, is a natural gift I was born blessed with. The extra leg, obviously behind Saint Michael occurred because I wasn't done (I thought at the time, but later realized to not change any part of this painting) painting and did intend on continuing the lower leg to that leg, but the business I was in was closing for the night, so I had to stop painting at that time, but intended on, at that time, continuing to paint this Fine Art piece, but left it as seen instead. Together, that extra leg with the Gold hand being held inside the hand of Saint Michael, in this completed painting, along with the fact that Saint Michael is obviously walking, moving forward in this painting, is a miracle also for another reason. The man that pointed it out to me shared that in the Old Testament it states, "God is the power behind Saint Michael, moving Saint Michael to do" the works that he does, or something similar to "the works that he does" at the end. I had read the New Testament twice when I was 12 years old, and part of the Old Testament, but I didn't know that, so, to me, it is a Miracle Painting! I hope it is for you too. May this Miracle Painting enlighten all to the light of Divine Love by which grace is bestowed as God's healing light shines upon the being, filling it with that light of love which shines forth from the being, transforming lives as understanding of intricate truths brings forth common understanding of patience and compassion, enlightening within each being and between beings, dispelling negativity, protecting, uniting through that Light of Divine Love. 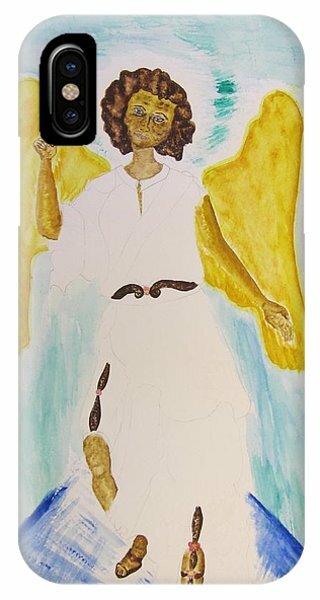 Fine Art America confirmed that my Watercolor Painting, "Saint Michael the Archangel Miracle Painting" shows fine in all options. May Saint Michael Guide our Leaders away from the path of destruction and toward Peace. 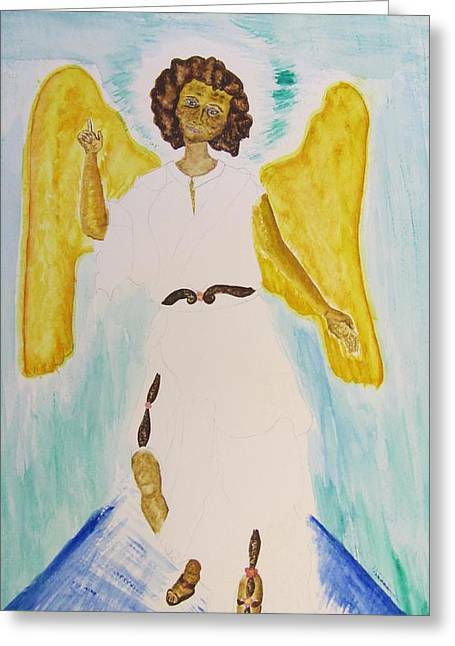 I see this changed the hand, but it is as I painted it, shading wise now, and I prefer the Golden Wings, so enjoy, and may it bring you many Blessings! Debbie - Debbie's Reflections Fine Art Gallery on Fine Art America. I renamed "Angel the miracle painting" to it's proper name: Saint Michael The Archangel Miracle Painting. This is the original printo from the Original Watercolor Painting. I added the outline to make it show more and made prints from that, but this one is without the added outline which I like much better. The outline is there, it is just very light, as should be. Reposted. Please read previous two comments. I also offered more sizes here. I like how this shows like the original watercolor painting I did. The Greeting Cards show less of the bottom showing, but that's o.k. I will check to make sure all the options shpw right as the PDF shows the Greeting Card blurry and the Framed Print off, but the Canvas Print looks great. I hope it brings many blessings to help increase peace in our World. 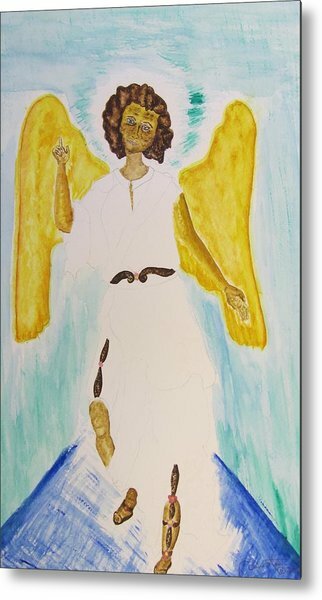 Reposted larger with more of the original Watercolor Painting showing and right colors: Saint Michael the Archangel as "Angel The Miracle Painting"
This watercolor painting I did of Saint Michael he Archangel, a miracle painting, doesn't show in my Fine Art Gallery: Debbie's Reflections Fine Art Gallery; however, it is available for purchase. 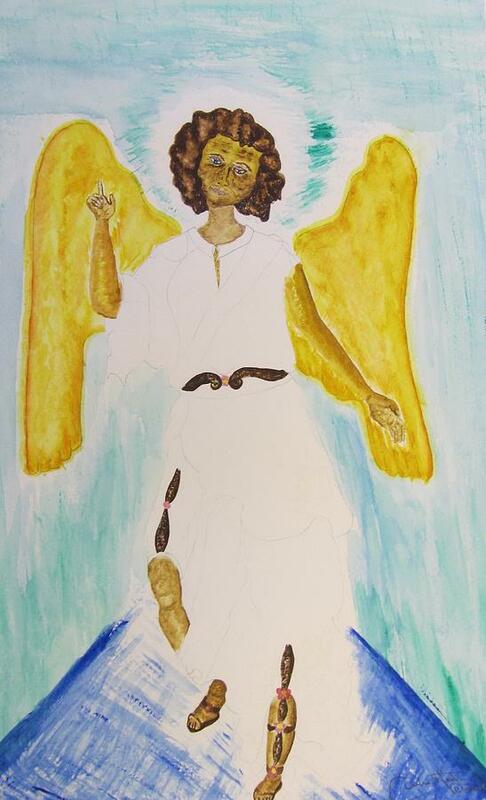 It is a mixed media Watercolor Painting- I used pencil to draw it, leaving some of the pencil showing - in the Robe of St. Michael, and after making the first print, went over the pencil in the Robe with a pen. 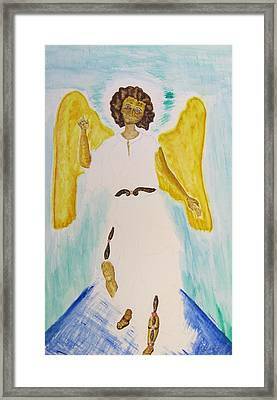 I removed the date and lowered the cost to purchase this miracle Angel painting.